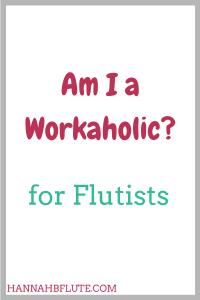 Am I a workaholic? Yes I am. Now, I’m going to tell you about how I realized I am a workaholic and how I am dealing with it. Workaholism is not *always* a bad thing, but it can get out of hand. I have let myself work too much, and I have faced negative consequences from it. I also believe that being a workaholic is normal. Especially in music or any creative field. Musicians do what they do because they love it. There’s no shame in loving what you do, but you do have to know your own limits. Stay relaxed with my Relaxation Plan worksheet! There are two kinds of people in this world. Some people need their downtime; they don’t have enough energy to stay busy all of the time. Other people, like myself, get restless without enough activity. I first realized this last spring, probably around Memorial Day. Since I currently work at a bank, the holiday was coming up. And since I work Saturdays, that meant I would be off two days in a row (Sunday and Monday). About halfway through Monday, I realized that I needed something to do. It could be work, it could be a social event, or it could be just getting out of the house. If I don’t have anything to do for awhile, I’ll get bored. I need that mental, physical, or social stimulation, or I might go crazy. While I don’t know of any studies on this topic, I feel like the need for activity leads very smoothly into workaholism. Workaholics love their work or they feel they have to work. Now that I am actually building a career in my chosen field of music and writing, it have become quite difficult to stop working. Writing this blog post is considered working. Because I have a channel for my need for activity, it’s easy for me to work a lot. Whether that is by writing blog posts for various clients or practicing or creating content for this blog. It’s hard for me to do nothing, especially when there is something else that I could be doing. I have had periods of burnout, and I want to minimize my risk of experiencing burnout again. So, I have created a relaxing evening routine. This helps me relax, and I have a set time to stop working each day. At about 8:30 pm, I stop practicing or writing, and I take a warm bath or shower. I try to enjoy it as much as I can, but I don’t want to use up too much water. After a bath or shower, I change into my pajamas and put on YouTube or Netflix. I try to avoid watching classical music related videos on YouTube, because the goal for me is to relax and not stress about my work. Then around 10:30, I turn out the lights and get some much needed sleep. If you need help relaxing, I suggest finding some sort of self care routine. My routine might change at some point. I may decide on another method of relaxation, and that’s okay. Do what feels right for you. Subscribe to get the Relaxation Plan worksheet! After learning some deep stuff about myself this year, I am now able to accept the fact that I’m a workaholic. It’s been hard, because it is not something I thought I would be. I’m realizing that being a workaholic isn’t all bad, but I do have to watch myself when it comes to working. I have to make sure the work I do end up doing is valuable. According to Psychology Today, musicians value their work. We feel a need for artistic expression and to share music with the world. Other creative professionals, like writers, also have a similar desire. As a blogger, I love sharing insights and tips with you guys. There are some cases where a person’s work might keep them from completing personal tasks, like chores. However, workaholism isn’t inherently bad. If you’re a musician, you’re probably doing it for the love of music and the love of your instrument. You love what you do, and that makes it easy to work a lot. And for musicians starting out, that extra work is actually necessary. At least in the beginning, you will have to do a lot of hustling to find gigs. You shouldn’t be ashamed of that. Just make sure you take care of yourself. You may have to practice a lot, but you also need to practice well! Any extra time you spend practicing needs to have direction, otherwise it is a true waste of time. Are you a workaholic? Don’t be nervous to say it…it’s okay! Now, tell me how you are going to relax today. Comment below!